The superfood of the paleo movement. Bone broth. - Radiant Reality | Nutrition. Healing Arts. Inspired Living. Ten years ago I connected with the research of the Weston Price foundation which led me to the work of Sally Fallon. Her book “Nourishing Traditions” was my first deep dive into the world of healing bone broths. However, I only prepared broth on occasion until six months ago when I began to explore the GAPS diet. GAPS (Gut and Psychology Syndrome) is a condition which establishes a connection between the digestive system and the brain. This diet supports healthy gut flora which in turn supports the functioning of the rest of the body. After reading this research I decided to commit to making a bone broth soup each week to support my families immune system. I can honestly say that it is one of the easiest and most nutritious foods for the body and it is in my opinion along with probiotics one of the most powerful gut healing strategies available to us. 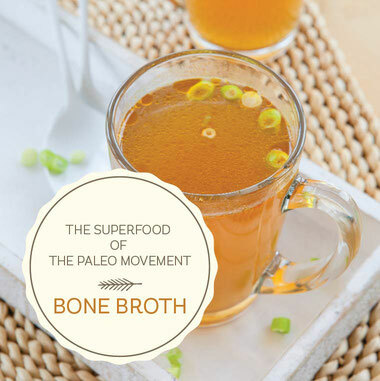 Bone broth supplies a raft of proteins that give your body the raw materials to rebuild your own connective tissues. As well as providing raw materials for healthy bones and joints, bone broth (coming from organic or pasture raised animals) contains minerals such as calcium, silicon, sulfer, magnesium, glucosamine, phosphorus, trace minerals, and glucosamine chondroitin sulfates. It also contains ample amino acids like, proline, lysine and glycine. Proline plays a role in reversing atherosclerotic deposits. It enables the blood vessel walls to release cholesterol buildups into your blood stream, decreasing the size of potential blockages in your heart and the surrounding blood vessels. Proline also helps your body break down proteins for use in creating new, healthy muscle cells. As far as the digestive benefits go, glutamine is a natural remedy for leaky gut. Glycine helps the liver with detoxification and also helps clear out excess methionine. Glycine from broths and cartilage can help break down homocysteine without the need for B vitamins ( which is big if you have methalation issues such as the MTHFR gene). There are also crucial nutrients in the marrow which is the densest source of fat soluble vitamins. Altogether this simple broth give your body easily digestible building blocks to help support your whole body. The best part for me is that it is extremely easy to make! Nothing in my mind beats homemade broth... although I have to admit last week I had a mind blowing bowl of chicken broth at the famous Ewehwon in Los Angeles! If I am cooking a chicken broth I use an organic chicken that I have roasted the night before and I will cook it for at least 24 hours in a crockpot. If I am cooking bones like organic beef bones, I will bring them to a boil first on the stove and skim off the impurities before transferring to my crockpot for 48 hours with 1 tbs of apple cider vinegar to help the minerals integrate into the broth. I also usually throw in carrots, celery, onion and garlic. Here is a simple recipe that is easy to follow for a larger soup. Here is what I have noticed in my own family. Nobody ever gets belly aches after a soup with bone broth. My children eat it quickly and it makes for a no fuss no muss dining experience plus I can easily integrate it into other dishes as well. Paleo movement or not... its a time tested food that is going to remain a staple in our diet.